Wednesday marks the 60th anniversary of a D-Day exercise which led to the deaths of more than 700 US servicemen off the south Devon coast. A total of 749 US military personnel were lost when German E boats launched a surprise attack on Allied ships crammed with soldiers at Slapton. The servicemen died as they took part in Exercise Tiger on 28 April, 1944. 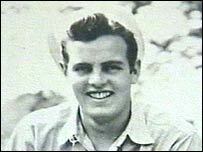 A number of Americans who survived Exercise Tiger are in Slapton on Wednesday to pay their tributes. 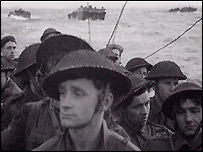 The disaster struck during the eight-day exercise, which used the beach in Slapton, south Devon, to practice for the D-Day landings. About 30,000 men and 300 ships were involved in the mock operation. The vessels taking part in Exercise Tiger were attacked by nine Cherbourg based German E-boats in the early hours of 28 April. One former US Navy seaman who survived the disaster, Thomas Glynn, has travelled to the UK to mark the anniversary. Mr Glynn, who was 17 at the time, said: "We started seeing flares we thought were part of whatever we were involved in. "After that we heard gun fire and then one of the ships blew up and we knew then we were under attack, but we had no idea before that." The disaster was kept a closely guarded secret during the war and little was published about it following the close of hostilities. General Eisenhower, supreme commander of Allied invasion forces, feared any leak could tip off the Germans and sap the morale of his troops. Mr Glynn said: "We were told 'what happened last night did not happen, under the threat of court martial you are never to talk to anybody about what happened last night'." But in 1969, a local man Ken Small walked along Slapton beach and discovered remains from the live practice exercises. He pressed the US and British governments for a memorial to the casualties so that their story would become common knowledge. Mr Small, who died in March, established a Sherman tank memorial at Torcross to the US servicemen who died in Operation Tiger. Mr Glynn said: "I'm here to honour the young men that died that night, that were my age, that did not have the life I've had. "I've had a great life, a wonderful marriage and a wonderful family and I am here to pay homage to them." Should Germans attend D-day events?